CHICAGO--(BUSINESS WIRE)--SwervePay, LLC, an innovative patient-centric payment solution in healthcare, announced its acquisition of StatPayMD to further provide healthcare consumers with the information, tools and transparency needed to manage their financial responsibility. StatPayMD (formerly Symbiosis Health) is a graduate of Blueprint Health, a healthcare IT accelerator in New York, and most recently based at MATTER in Chicago. StatPayMD makes it easy for patients to understand “out-of-pocket” costs before and at care. With SwervePay’s payment tool, patients can better communicate around cost of care, understand payment options, and pay their bill on the go and in a way that is convenient for them. SwervePay offers an innovative suite of tools for making patient payments – no mobile apps, no paper, just one-click payments via text message. The portal-free platform also alleviates manual tasks in the revenue cycle process for providers and health systems. The majority of negative reviews for healthcare providers often stems from surprises in one’s medical bills, not because of bad patient care. Even though 92 percent of insured consumers are both able and willing to pay their out-of-pocket medical expenses, 15 cents of every dollar is lost on claims processing, payments, billing and revenue cycle management, totaling a nearly $300 billion loss for the healthcare industry each year (McKinsey). To solve this problem, educating patients about their insurance plans and offering convenient payment choices needs to be an integral part of the patient experience. The biggest bottleneck to a reliable cost estimate is accurate benefits data. Benefits plans are becoming increasingly complex in design with special carve outs and coverages for different procedures. StatPayMD uses a combination of technology, services and direct partnerships with insurance companies to access relevant and accurate eligibility data from every health plan. The analytics engine blends that data with providers' negotiated contracts and claims history to create an accurate, personalized cost estimate for each patient. “We’re thrilled to join the team at SwervePay and continue our mission of making it easier for healthcare providers to help patients better manage their financial responsibility in healthcare,” said Piyush Kedia, founder and CEO of StatPayMD. SwervePay launched in 2010 to focus on providing a simpler way of communicating among patients and providers. In February 2016, the company announced it completed a $10 million Series B funding round, led by Chicago-based Garland Capital Group. 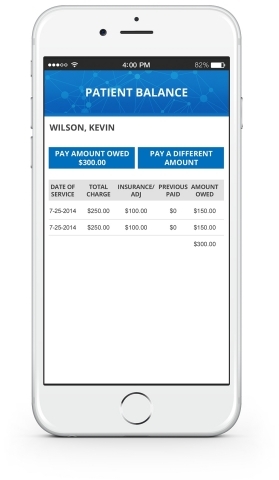 SwervePay, based in Chicago, is leading the patient-provider revolution by reducing the complexity of interacting with today's patient-facing technologies and eliminating mobile apps and repetitive paper statements. Healthcare providers and health systems are able to engage patients with a simple text message that lets them securely submit payments, estimate care costs and confirm appointments with one click. The cloud-based system presents the right data at the right time, greatly improving patient payment resolution. SwervePay eliminates statement cost, improves hospital staff efficiency and collects patient balances faster. SwervePay draws on a proven track record of success to significantly increase cash flow to hospitals, health systems and practitioners. Learn more about SwervePay at www.swervepayhealth.com.